A gift to Cancer Patient Services can give hope and comfort to a person dealing with a cancer diagnosis. Every donation means so very much and all contributions are tax deductible to the extent allowed by current law. It's easy to make a donation. We accept major credit card donations by phone at (419) 423-0286 or you may download the following form and send it to: Cancer Patient Services, 1800 North Blanchard Street, Suite 120, Findlay, OH 45840. Make checks payable to: Cancer Patient Services. 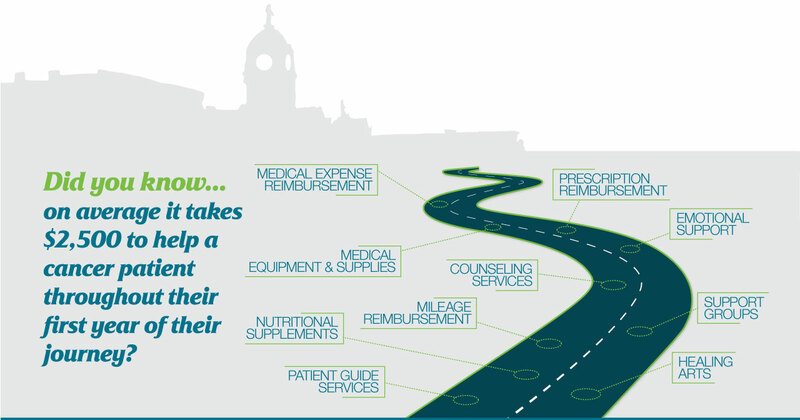 There are many ways you can give to Cancer Patient Services. One important way is to remember CPS with a planned gift in your will. In this way your support will have impact well into the future when you are no longer able to provide an annual gift. CPS' strategy for unrestricted major gifts is to support long-term initiatives of the organization when possible. This would include expanding client services, increased financial support for medication and mileage, the addition of a case worker to the CPS staff and expanded cancer screening and prevention services. $2,500 will buy: 2 hospital beds; 5 wheelchairs; 2 lift chairs or 48 shower benches. $1,000 will buy: 2 wheelchairs; 1 lift chair; or 8 bedside Commodes. $500 will buy: 55 mattress covers; 20 cases of Ensure®; 25 cases of Carnation®; 8 over-the-bed Tables; 4 bedside commodes; 10 shower stools or 1 wheelchair. $100 will buy: 4 cases of Ensure®; 5 cases of Carnation®; 3 cases of Boost®; 24 pkgs. of med. briefs; 11 pkgs. of Depends; 40 pkgs. of Chux; or 8 pkgs. of Pull-Up Briefs.